Indigo have designed and enabled a number of projects at Salisbury District Hospital over the last decade. These include the redesign and layout of several car parking areas and the remodelling of the entrance to the main hospital building. The design of the entrance area involved creating a new bus turning area, which departed from conventional highways practice, being based upon measurements taken ‘in the field’ using a vehicle kindly loaned by the local bus company. This brought about a practical solution using less space than would otherwise have been required. 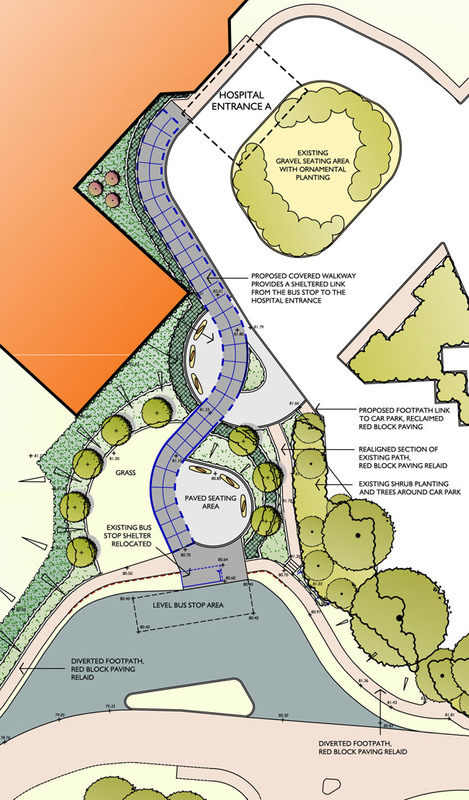 A covered pedestrian walkway also formed part of our proposals, with an attractive sinuous form ensuring a comfortable gradient within the confined sloping site.